You know that the trend is your friend. Not all trends are created equal! I do not know why traders don't talk about it. They talk as though trends, they are all the same, but it's not. The three types of trend that every trader must know. When is the optimal entry point to enter a trending market, depending on what type of trend it is. And finally, by the end of this video, you will be a professional trend trader who can handle, who can profit, in the different types of trending markets. A strong trend is when the trend is strong, okay? So, how do I actually define a strong trend? This over here is the 20-period moving average. As you can see, the market remains below it. This gives you a big clue that this trend is actually strong, and that's why it has been consistently below the 20 MA. How would you trade a strong trend? In this case, since it's a downtrend, you want to trade the breakdown of the swing low. Why do you want to trade a breakdown? Because in a strong trend, seldom does it do a nice pullback for you to time your entries. Seldom does it retest a moving average. Seldom does it retest resistance. You will be disappointed because the market, is in a strong trend! That's why it doesn't have a deep retracement. If you want to trade pullback or retest or key levels, again you will be disappointed. That is why I say that in a strong trend it's ideal to trade breakouts or breakdowns. In this case, you can just simply go short when the market breaks below the swing low. And to set your stop loss, ideally, you want to set it beyond the 20MA. Don't just put it above the 20MA because what could happen is that the price can spike up higher and then collapse lower. So, give it a distance, give it some buffer above the 20-period moving average. How do you know that a trend is healthy? A healthy trend usually has a clear pullback towards the 50-period moving average. This means that you can actually time your entry towards the 50-period moving average. The market has tested the 50MA four times. What you need to do is wait for the market, be patient, and let it come back towards the moving average. These are all entry points that we can use to trade in a healthy trend. A confluence factor that you can look at is not only the 50MA, but also at previous support turned resistance. This is where there's a good chance of the market reversing in a healthy trend. And to time your entry to just wait for a reversal candlestick pattern and you can time your entry. And again, you don't want to set your stop loss just above the moving average. Give it some buffer, give it some distance away from it. You can use an indicator like the Average True Range or just eyeball or give it some buffer. This is how you would go about trading the healthy trend. So, what I don't recommend in the healthy trend is that you don't necessarily want to trade breakouts. You can see that the market went slightly in your favor and then you have to swallow deep pullbacks against you. This would happen often if you were to trade breakouts on a healthy trend. You would have to endure quite a sharp pullback when it comes back towards the moving average. It doesn't happen often, but more often than not it will revert back towards the mean. So, this is why I don't really recommend trading in breakdowns or breakouts in a healthy trend. It's much better to time your entry and wait for a pullback, either towards the moving average or previous support and resistance. For example, a weak trend usually occurs when the price doesn't respect the 50-period moving average anymore. It tends to exceed beyond it. Price has been respecting the 50MA and then it trades beyond it repeatedly. So, how do you actually trade the weak trend? This is where your support and resistance come into play. What I'll do is I will now time my entries at resistance! Since this is a downtrend. You have this Dragonfly Doji rejecting the highs. Then the next candle had a slight bull candle and finally, another candle reverses lower towards the downside with a bearish close. This is a sign of price rejection and if you look at this, you can look to go short again. And set your stop loss a distance away from the highs. And this is how we actually trade the weak trend when the price comes towards an area of value like support or resistance. This is the same thing as the healthy trend. Are you sure that you still want to chase the market at this point, even though it's a strong trend? Even though it's breaking down, are you sure you still want to go short? Because if you think about this, right now the price is very far away from the 20MA. You have to potentially endure that retracement. So, is this a good trade that you want to take? I don't want to be trading when the price is so far away from the moving average. If you are to go short, it is much nearer towards the 20MA so even if the pullback were to come, you don't have to endure that much pain. This is a lot of distance that you have to endure in a pullback. So again, you want to watch where price is relative to the moving average. If it's too far away, I usually suggest the trader to wait for the price to come to you. So that's the first tip that I want to share with you. And are you interested for an additional tip? 2. We trade the pullback by using very basic reversal candlestick pattern. But what I want to share with you is more advanced stuff. And it's ideally for traders who have really been trading for at least a year or more. It's because you can actually use multiple timeframes to time your entry. You know that it's in a healthy trend and you see that AUD/USD, came into an area of value (50MA). One way you can go about it is that traders can just go short based on this reversal candlestick pattern! Alternatively, if you want to better time your entry and have a better risk to reward. Notice that the market has actually formed a lower low and a lower high. So instead of originally when you're trading off the daily candlestick pattern, the daily price action, your stop loss would go a distance beyond the high shown in the example. But right now, if you go down to the lower timeframe. You can actually reduce the size of your stop loss and improve your risk to reward! You go short on the break of the lows and set your stop loss just a distance above the highs. And then getting a tighter stop loss on your entry. This concept can be applied whether it is a strong trend, healthy trend, or a weak trend. Notice over here the market came into this area of resistance. Of course, traders can trade this daily reversal candlestick pattern. You have a series of higher lows and higher highs. But over here at this structure, things have started to change! The highs and lows are pretty much equal now. Again, you would have a tighter stop loss compared to trading it on the daily timeframe. This is a very powerful entry technique that involves the use of multiple timeframes. Then it breaks the previous low swing structure, then, you can go short on the break of the swing low. Stop loss is just set a distance away from the highs. You can see that you have a much tighter stop loss in this case. You are leaning against the resistance on the daily timeframe. You are leaning against the 50-period moving average which is another market structure that the market has respected. This is an additional tip for you. I believe it would really help your trading. It can be applied whether you are trading support resistance, a weak trend, a healthy trend or even a strong trending market. If you don't believe me, let me share with you another example. Just a final one, okay? So powerful that I have to share more with you. If you look at this 20MA on the daily time frame. You see the same phenomenon. Again, you can just trade off the price rejection on a daily. Notice over here this is a lower high and lower low! You can see in this case you have a much tighter stop loss and a better risk to reward on your trade. With that said, I have come towards the end of today's video. Strong trend tends to respect the 20MA. Ideal to trade breakouts. Healthy trend tends to respect the 50 MA. Ideal to trade the pullback towards the 50MA or previous support and resistance. And a weak trend, the price tends to trade beyond the 50MA. Ideal to trade a pullback towards a market structure like support or resistance. Then we talked about trading breakouts. You want the price to be near the moving average, as near as possible. 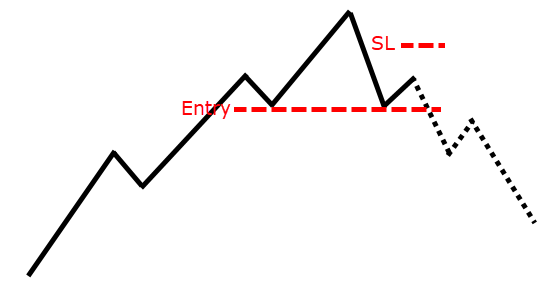 And finally, we talked about the break of structure technique, how you can go down to a lower timeframe to better time your entry and get a better risk to reward on your trade.